Last night we totally ignored the Oscars. Not intentionally, or in protest over the annual Sturm und Drang that churns up every year, dominating everything for weeks ahead of the event. It was because our neighbors are planning to remodel their kitchen and I'd highly recommended the contractor who did ours. This, of course, necessitated a viewing of his handiwork and a discussion of the process involved in what is often a fraught undertaking. Which, in turn, provided the opportunity to suggest a live demonstration in the form of drinks and dinner the next weekend. The drool-inducing standing rib roast. It had been awhile since we'd pulled some Petunia out of the freezer, and grilled chops were sounding pretty tempting. 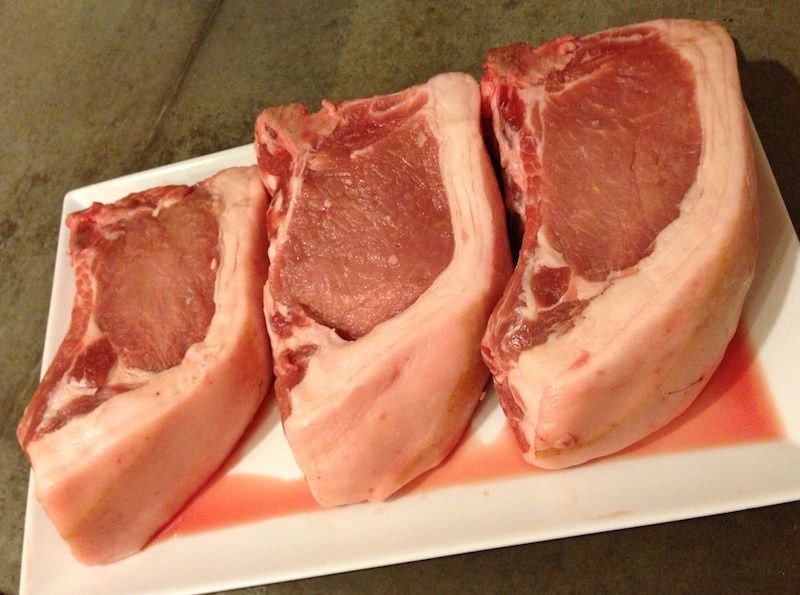 So the day before the dinner I opened the freezer and pulled out three white paper packages labeled "2 Rib Chops." Now, it had been a little over two months since Linda and I had done the butchering, and I was a little foggy on some of the finer details of the decisions I'd made. Assuming that the packages contained two chops each, I figured six would more than feed five people, so I set them out to start thawing. A few hours later I peeled off the paper and the plastic wrap and discovered that, instead of the six inch-and-a-half thick chops I expected, there were three humongous three-inch thick pieces, more like three small roasts (top photo). 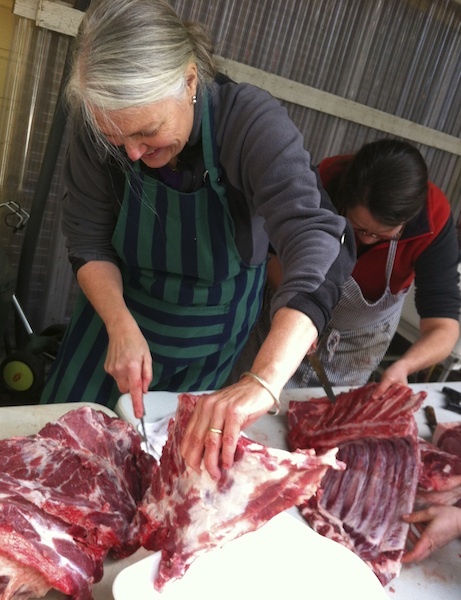 That's when the memory rushed back of that long, cold day on the back porch at Ayers Creek Farm, working through the carcass and deciding what cuts to make, choices that would determine so many future meals. 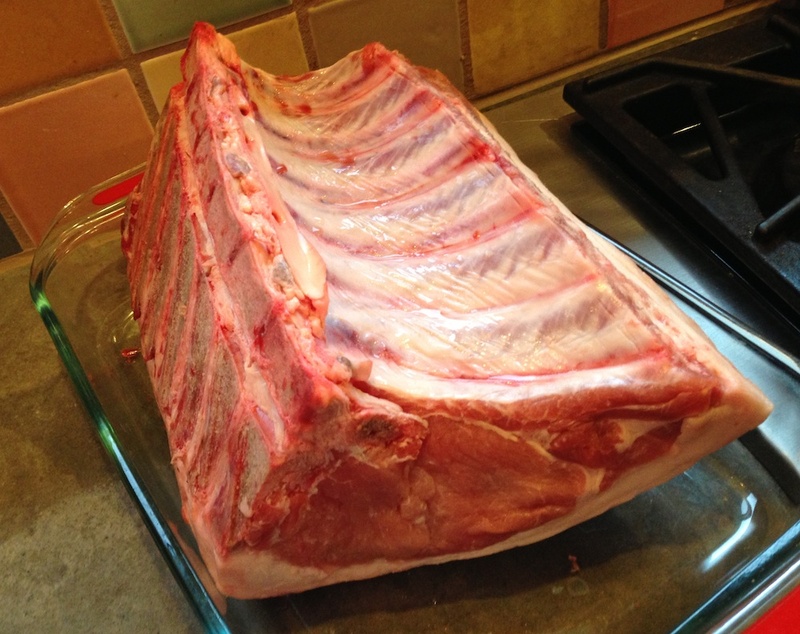 I remembered looking at the gorgeous section of the primal containing the backbone and the ribs, and the decision to cut one long five-rib roast (above left), destined to be the star of our Christmas dinner, and several double-rib chops. The reasoning behind the double chops was two-fold: first, the way the backbone was constructed, it was easier to slice between every two ribs rather than every rib and, second, those huge chops would be singularly impressive to pull out for dinner sometime. And that's what I'm gradually learning is the true joy of butchering my own meat: I'm not only getting familiar with the structure of an animal, I get to make choices as to how it's divided, which then gives more choices for how to prepare it. Combined with the fact that I know exactly who raised the animal, what it was fed and where it was raised, as well as knowing that my money is going to support a small family farmer in my area who produces a sustainably and responsibly raised animal. Though he'd never grilled pork chops that size, Dave decided to treat them like a pork roast, searing them over the coals, then pushing the coals to the side and roasting the chops over indirect heat. Moist, tender and luscious, these were chops that more than did right by the pig they came from. Thank you again, Petunia! 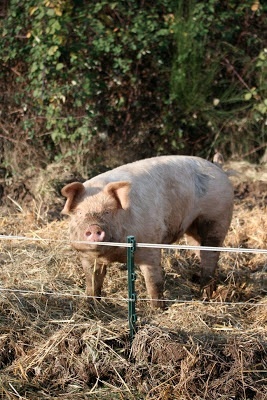 Photo of Petunia by Clare Carver. We butcher our own deer and elk on our kitchen counter. SO much work, but nice to get exactly what cuts you want, and have control of the quality. Plus, our dog gets all of the scraps :-). My 2 boys help, and learn, and we all value it so much more after all of that work. Becky, I couldn't agree with you more. Thanks!